Pharaohs were certainly the high rollers back in ancient Egypt. Now you can play the high roller version of Novomatic’s top Egyptian slot game. If you’ve got funds like a Pharaoh then choose this high-roller version of this most popular Novomatic slot. Thousands of players choose to spin these Egyptian-style reels every day! There are 5 Pharaoh-tastic reels, 10 paylines and lots of Egyptian charm in High Roller Book of Ra Deluxe. This video slot is much like all the others in this set. You’ll see the same symbols, the same background and the same logo! The archaeologist is the lead character and seeing him in this slot is like meeting up with an old friend. In fact, the whole slot will feel familiar. The reels are beautifully decorated with carved hieroglyphics. Beyond them, you can see the logo floating in the Egyptian desert! The sun is setting behind two, towering pyramids and a scattering of palm trees. It might look like a desert now but back when the ancient Egyptians were living there, it was a lush valley of the river Nile! The ancient Egyptians grew barley, papyrus, leeks, squashes, garlic, melons and grapes. This slot is designed to show you all the luxuries that the upper-class ancients used to enjoy! The slot is teeming with images of gold and precious gems! It’s the perfect choice for high rollers who are into history. You can play like a pharaoh and win like a pharaoh in this Novomatic casino video slot. High rollers may also be keen to try: High Roller Lucky Lady’s Charm Deluxe, Wild West, High Roller Jackpot, Jackpot Diamonds and Shooting Stars Supernova. The symbols in High Roller Book of Ra Deluxe are great examples of the sort of wealth that Egyptian high rollers would be used to! From the pyramids, the burial chambers of Egypt’s pharaohs, we can tell that Egyptian royalty loved to show off their wealth with gold and jewels – and they also wanted to take their most prized possessions with them into the afterlife. There’s one pharaoh whose treasures can be seen in this slot. In addition to his beautiful golden mummy mask, this pharaoh had a golden statue of the goddess Isis and a sapphire and gold scarab beetle. These three symbols are worth a lot in this video slot game. The archaeologist is worth even more! He looks like he could give even Indiana Jones a run for his money. In contrast to the lavish picture symbols, there are card symbols which pay more often but give smaller wins. These are: 10, Jack, Queen, King and Ace. They’re designed in an ancient-style so the font fits in very nicely with the theme! 2 matches minimum are needed for picture symbol wins. 3 matches minimum are needed for card symbol wins. For the win to be paid, the required number of matches must fall on a payline, starting from reel 1 (on the far left) and following on adjacent reels. Wins can be gambled using the 50/50 card game feature. During autoplay, wins are automatically added to your balance. You can stop autoplay if you want to gamble a win. Ra was the Egyptian God of the sun – no wonder his book is covered in gold! He was worshipped by many ancient Egyptians, and now his book is worshipped by many slots players! As we have already mentioned, this series of slots from Novomatic is by far their most popular. 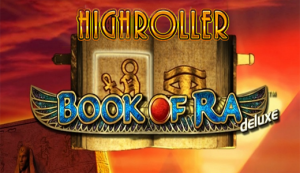 The Book of Ra slots are mostly loved for the cool bonus feature that’s usually very lucrative! In fact, all of the special features in this slot have something to do with the golden Book of Ra. For starters, the book is the Scatter symbol and pays scatter wins for 3 or more matches. Secondly, the book is the Wild symbol and it can act in lieu of any missing symbol to complete a win. Thirdly, the Book of Ra triggers the bonus! In High Roller Book of Ra Deluxe, the bonus is the same as for most of the slots in this set. When you trigger the bonus, you will get 10 Free Games that come with the special expanding feature. Players really love this bonus feature! So much so that many other, newer slots have a similar bonus feature to this one. Before you spin the reels for your 10 Free Games, the Book of Ra will open and flick through its pages to reveal the chosen symbol. Whichever symbol it picks, that will be the special expanding symbol for the 10 Free Games! This symbol will expand to fill entire reels and it will be able to award non-consecutive wins, including wins that don’t follow paylines! For the picture symbols, any two matches will expand and pay all ways. For the card symbols, any three matches will expand and pay all ways.